There have been some great duos in comic books: Batman and Robin, Rocket Raccoon and Groot, Power Man and Iron Fist, Green Arrow and Black Canary, Captain America and Falcon… but none have been as memorably silly, playful and tragic as Blue Beetle and Booster Gold. As great as each of them has been individually over the years, there’s a bond between them that makes having one without the other seem… well, wrong. Blue Beetle was an engineer with agility, a mean right hook and a love of banter… and an eating disorder. Booster Gold was a disgraced athlete and time-travelling glory-hound out to make a quick buck and get some good PR. But neither ever seemed to get any respect, and it was in the pages of the legendary Justice League International where the two forged their unusual friendship. They became a wisecracking and irresponsible team who embarked on get-rich-quick schemes between their superhero antics, entertaining fans and becoming one of the most recognisable pairings in DC history. 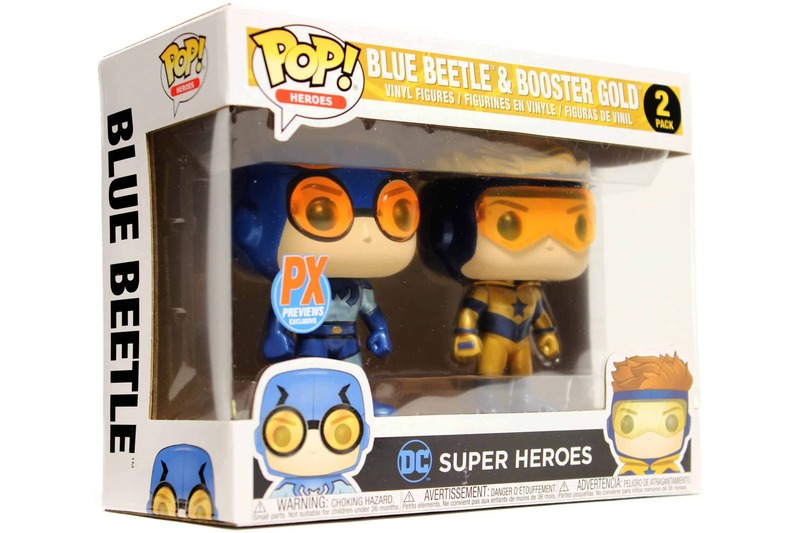 Blue Beetle And Booster Gold became inseparable, to the point where both featured in the same episode of the TV show Smallville, and one of the best episodes of the animated Batman: The Brave And The Bold focused on Booster travelling back to before Beetle’s tragic death, just to share one last adventure with him. Even after Beetle’s death in comics, writer Geoff Johns incorporated a major storyline in the Booster Gold series where Booster tried to save his best friend’s life. 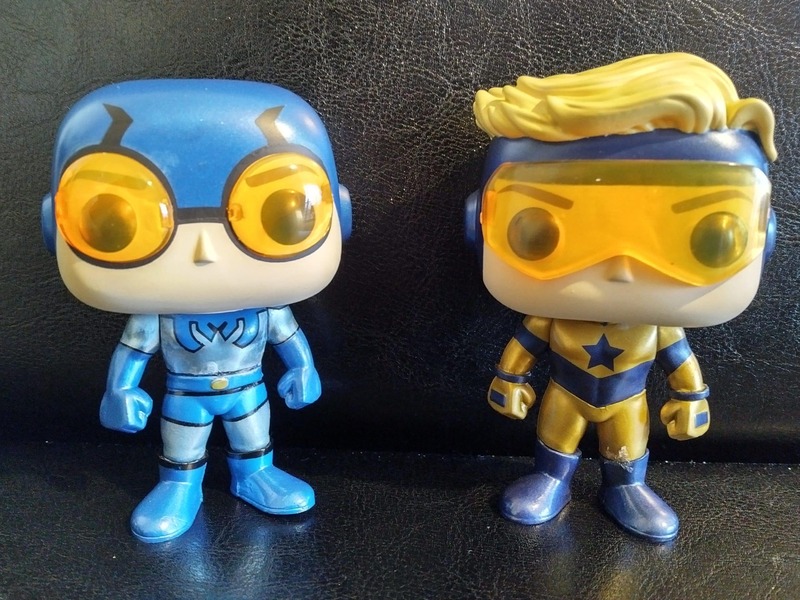 Blue Beetle And Booster Gold are a pair, and that’s how it should be. So it’s good news that Funko POP has chosen to release the two buddies as a double-pack, celebrating the heroes and their friendship. Not only that, but they’ve doubled down on the duo by creating a pair of sets for collectors and fans – one being with a regular paint scheme and one being an exclusive set with metallic paint. And, like most Funkos, they’re absolutely adorable and thankfully both are in their classic costumes. However, it should be noted that there’s a minor flaw or two (or at least with the metallic set). The one which should be immediately apparent is that Booster’s figure is missing his flight ring. It’s a small detail, but one which is sometimes overlooked even by comic book artists, and here it should have been picked up on by the designers. The other problem is a genuine design flaw, which is that Blue Beetle’s feet don’t seem equally level. On some figures that would be okay but, due to the dimensions of the figure, it simply means that he doesn’t stand properly and keeps falling over. It’s fair to say that Blue Beetle And Booster Gold look amazing no matter what, but when you need to apply a small blob of Prestik, Blu-tack or other adhesive to the bottom of one foot just to get him to stand up, it’s a little bit of a let-down. But… damn, they look so good! Despite these minor gripes, they’re a fantastic set and should make every Blue and Gold fan happy. That they’re sold as a twin-pack might annoy some, but it really does make the most sense because the two characters really do belong together, whether it be in comics, on screen, or as toys on a shelf or stand. 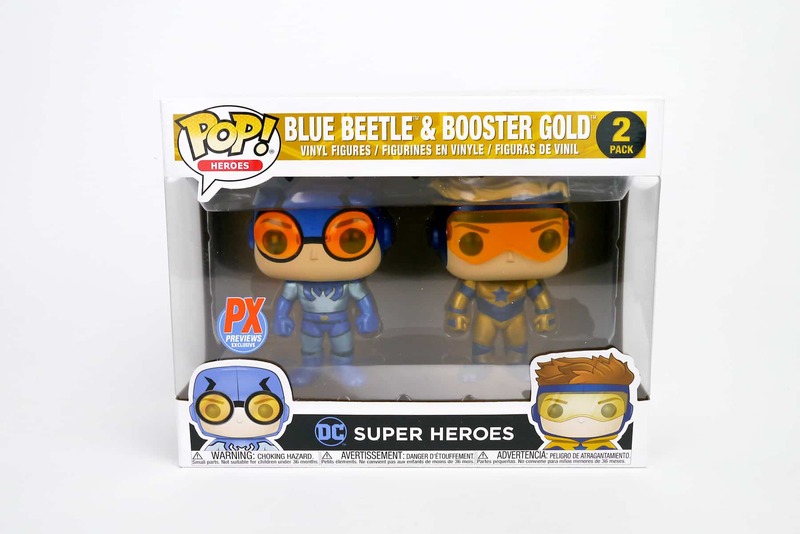 Blue Beetle And Booster Gold may not be the most likely of heroes, but this Funko set gives them some of the boosterific credit they rightfully deserve. Bwahahahahaha!